370 pages | 2 B/W Illus. 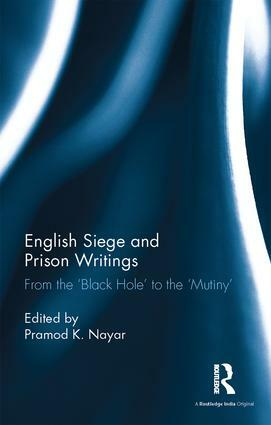 This volume brings together an unusual collection of British captivity writings – composed during and after imprisonment and in conditions of siege. Writings from the ‘Mutiny’ of 1857 are well known, but there exists a vast body of texts, from Afghanistan, Sri Lanka and Burma, and the Indian subcontinent, that have rarely been compiled or examined. Written in anxiety and distress, or recalled with poignancy and anger, these siege narratives depict a very different Briton. A far cry from the triumphant conqueror, explorer or ruler, these texts give us the vulnerable, injured and frightened Englishman and woman who seek, in the most adverse of conditions, to retain a measure of stoicism and identity. From Robert Knox’s 17th-century account of imprisonment in Sri Lanka, through J. Z. Holwell’s famous account of the ‘Black Hole’ of Calcutta, through Florentia Sale’s Afghan memoir, and Lady Inglis’s ‘Mutiny’ diary from Lucknow, the book opens up a dark and revealing corner of the colonial archive. Lucid and intriguing, this book will be of great interest to scholars and researchers of modern South Asia, colonial history, literary and culture studies. Pramod K. Nayar teaches in the Department of English at the University of Hyderabad, India. His most recent books include The Indian Graphic Novel: Nation, History and Critique (Routledge, 2016), The Transnational in English Literature: Shakespeare to the Modern (Routledge, 2015), the edited Postcolonial Studies: An Anthology (2015) and the Postcolonial Studies Dictionary (2015). A book on human rights and literature and an edited five-volume collection Indian Travel Writing, 1830–1947 are forthcoming, besides essays on celebrity studies, graphic biographies and colonial etiquette books.